Bayonne, Musée Bonnat, no. 1741 (formerly no. 144). Pen and ink and point of brush and brown wash over traces of black chalk, lightly squared in black chalk; 33.4 x 26.1 (the drawing is contained within a quarter-circle with the arc at the left, its edge drawn twice, the outer one enlarging the area of the bottom by about 1.5 cm, but rising to the same point at the top as the inner arc); laid down; wm.? ; a horizontal tear just below the center, apparently where the drawing was once folded, has been repaired. PROVENANCE: Mariette (Lugt 1852); Bonnat (Lugt 1714). 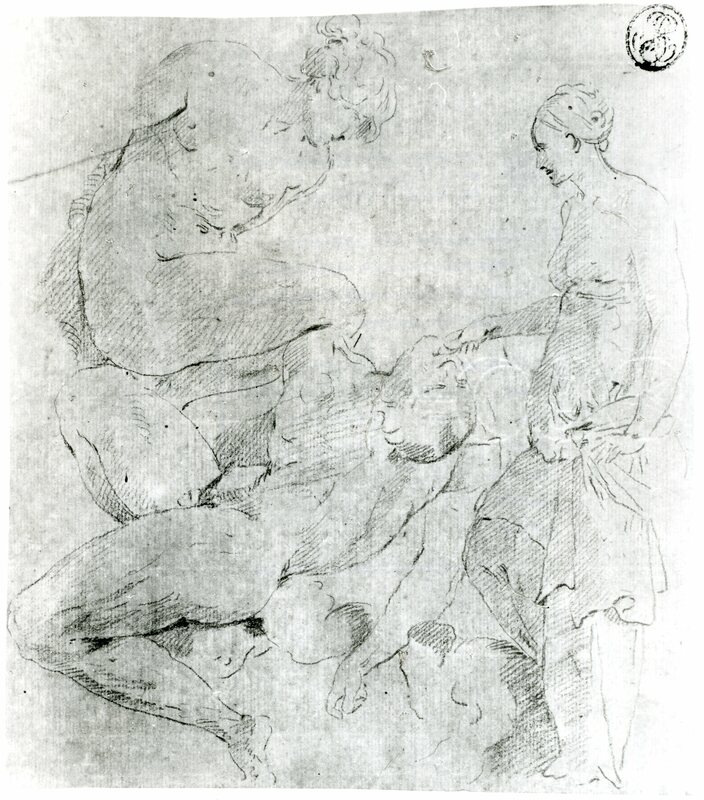 Serie degli uomini i più illustri nella pittura,…, V, Florence, 1772, 200, no. 1, as Rosso. Basan (Mariette sale), 1775, no. 677, as Rosso. Milanesi, in Vasari-Milanesi, V, 164, n. 3, mentioned that a drawing by Rosso of the Throne of Solomon for the Lagrime project was in Mariette’s collection. Gustave Gruyer, Ville de Bayonne. Musée Bonnat. Collection Bonnat. Catalogue sommaire, Paris, 1908, 77, no. 144, as Rosso. Kusenberg, 1931, 104, 137, 138, no. 2, 190, n. 94, PL. 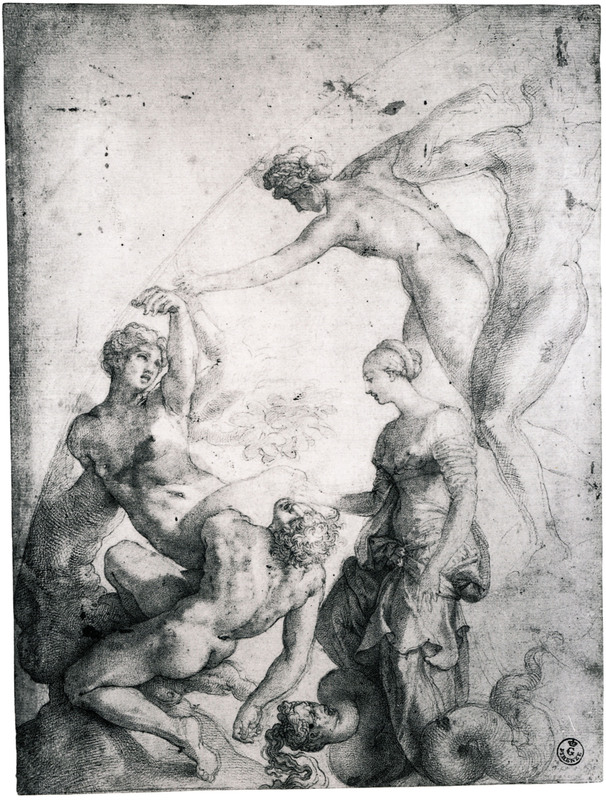 LVII, as Rosso, and, by implication, that it was done for a lost fresco at Fontainebleau; also that another unknown drawing of the same scene was owned by Mariette. Berenson, 1938, no. 2392A, as Rosso. 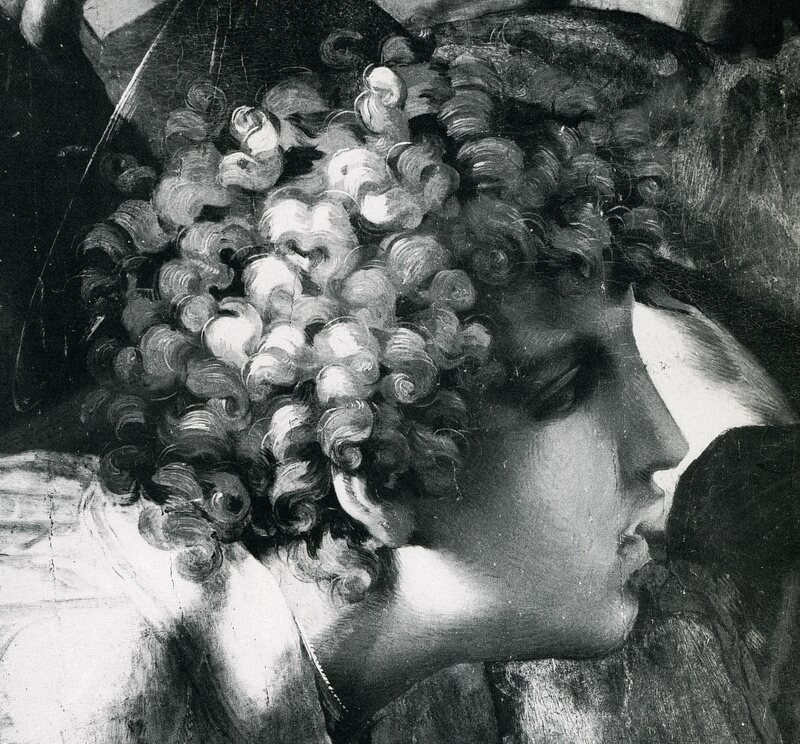 Becherucci, 1944, 30 (1949, 30-31), as Rosso, for the Lagrime frescoes. Barocchi, Commentari, I, 1950, 159, 160. Barocchi, 1950, 71-73, as Rosso and probably for the Lagrime project; she recognized the influence of Dürer and Hans Baldung Grien. Bean, 1960, no. 146, as Rosso, for the Lagrime project. Carroll, 1961, 446, 447, Fig. 4, as Rosso, for the Lagrime frescoes. Berenson, 1961, no. 2392A, as Rosso. Forlani, , 168, under no. 29, as Rosso. Carroll, 1964 (1976), I, Bk. I, 187, 191-196, 199-202, 204-205, 207, II, Bk. II, 301-308, D.30, Bk. III, Fig. 88. Borea, 1965, as recording part of the Lagrime project. Shearman, 1966, 164, as Rosso. Carroll, 1966, 168, 169, as Rosso. Fagiolo dell’Arco, 1970, 110, n. 12, Fig. 227. Salmi, 1971, 123, 135, n. 24, as Rosso, for the Lagrime frescoes. Collobi Ragghianti, “Libra de’Disegni,” 1971, 22, 23, Fig. 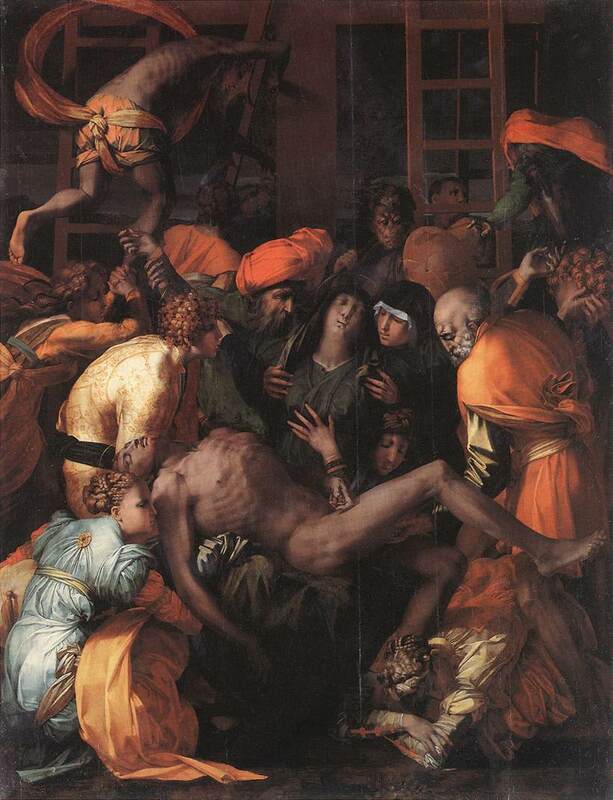 11, as Rosso, and as once in Vasari’s collection of drawings. Monbeig-Goguel, 1971, 87, Fig. 2, as Rosso, for the Lagrime frescoes, and as reflecting an interest in Leonardo’s light and in the art of Piero di Cosimo. Ragghianti Collobi, 1974, I, 118, II, 201, Fig. 372, as Rosso, and as part of Rosso’s “modello” for the Lagrime project that was owned by Vasari. 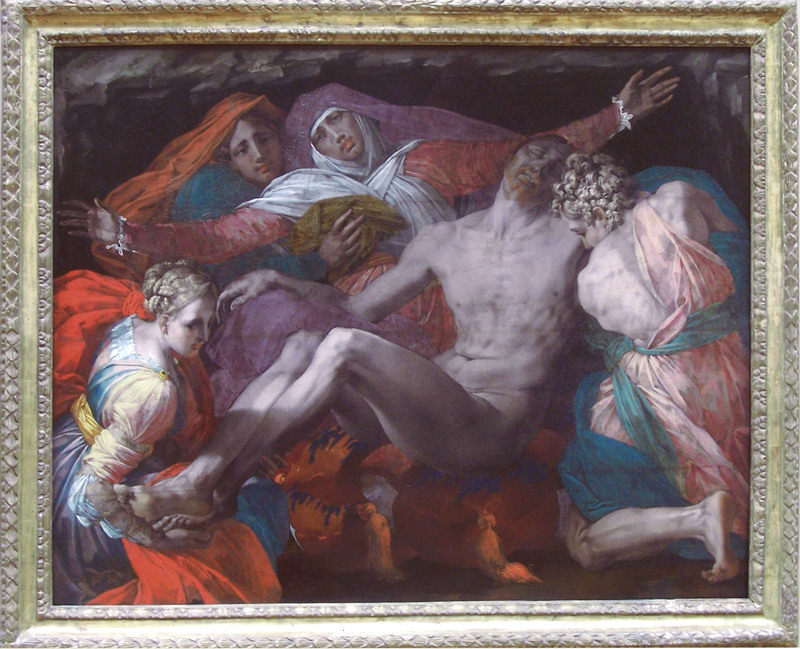 Shows traces of restoration of the kind used by Vasari. 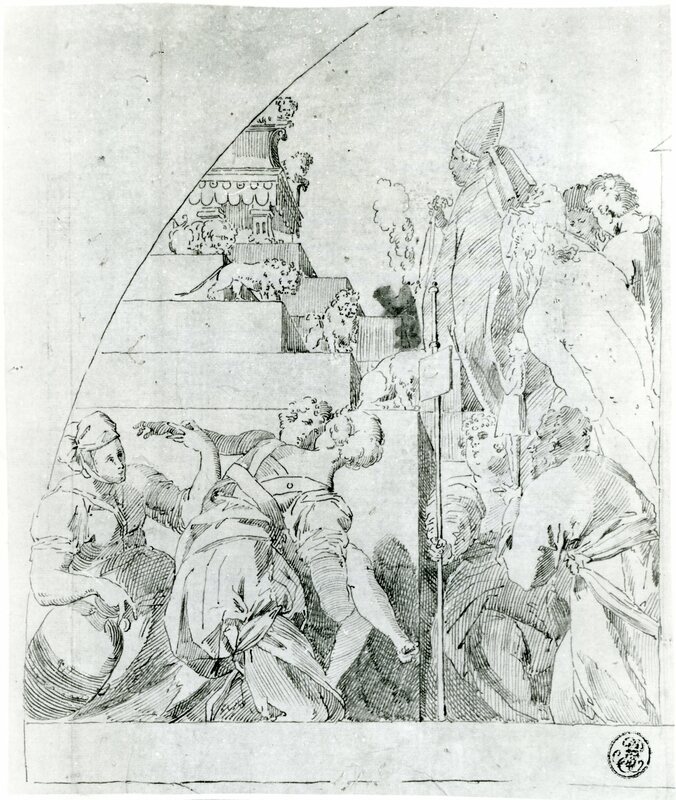 Michael Hirst, “A Project of Michelangelo’s for the Tomb of Julius II,” Master Drawings, XIV, 41, 1976, 380, as Rosso and graphically related to drawings that he attributed to Michelangelo for the 1513 project of the Tomb of Julius II. Julian Klieman, in Giorgio Vasari, 1981, 104, under no. 2. Darragon, 1983, 51, Fig. 32. Carroll, 1987, 10, 26, Fig. 3. Franklin, 1994, 198, 237-241, 246, 255, Pl. 187, as by Rosso, for the Lagrime project. Ciardi, 1994, 85, 88, Fig., 97, n. 159, as a theme favored by Dominicans, but mostly in Northern Europe. The attribution of this drawing to Rosso has never been questioned. Bean thought that certain unspecified contours had been redrawn, perhaps by another hand. But such redrawing, if it exists, must be very limited, for no lines appear obviously to have been re-worked. The steely character of the penmanship is characteristic of this kind of drawing by Rosso. However, the drawing has been rubbed in places, which is especially visible in the washes. 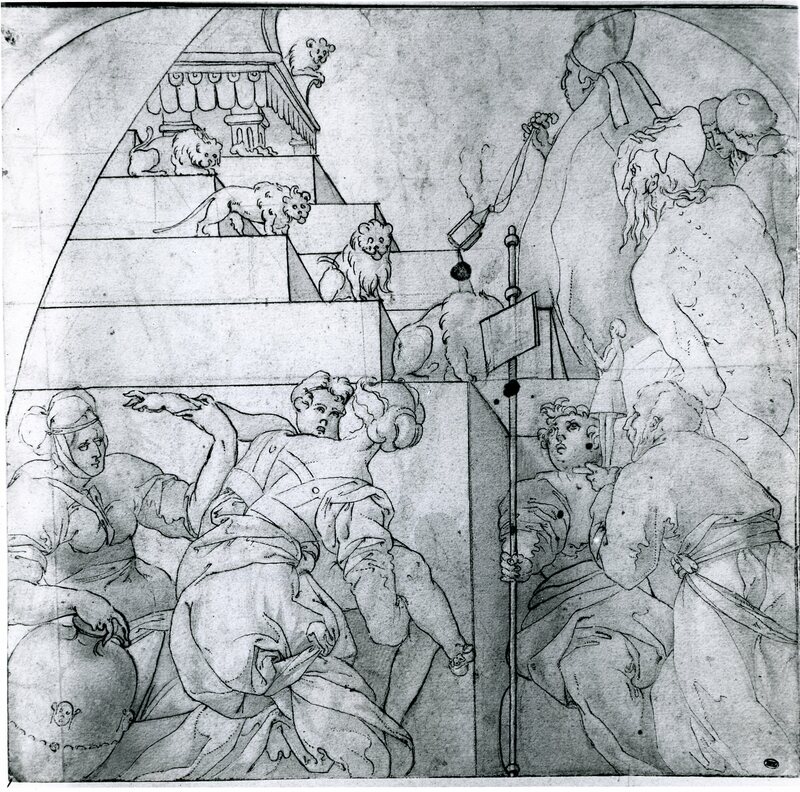 The drawing can be related to Vasari’s description of a cartoon of the Throne of Solomon that Rosso made for the frescoes that he was to execute at S. Maria delle Lagrime in Arezzo. The quarter-circle shape of the drawing, which would have been made before the cartoon, matches the wall areas of the center bay of the atrium that were to be painted, and the pointed corner indicated in the drawing at the upper right matches the end of one of the pediments over the interior windows of the north and south walls. 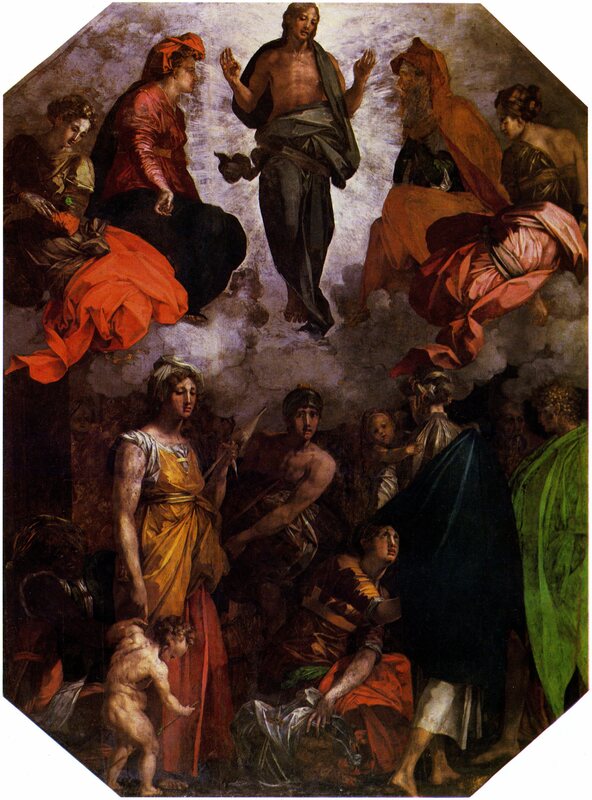 The organization of the figures in the Throne of Solomon in a series of narrowly spaced planes all parallel to the surface of the design reveals the same mode of composition that characterizes Rosso’s Pietà in Borgo Sansepolcro (Fig.P.19a), his Christ in Glory in Città di Castello (Fig.P.20a), and his Pietà in the Louvre (Fig.P.23a). Although the shape of the Bayonne drawing does not lend itself to a strictly symmetrical composition, the figures and the other forms in the scene are balanced against each other at either side of a rather well defined central axis. This occurs also, but with more precision, in the rectangular pictures in Borgo Sansepolcro and Città di Castello. The richly dressed women in the drawing are clearly related to those in the same two paintings. Such old bearded men as appear in the Throne of Solomon are also found in the Borgo Sansepolcro picture, and the round-faced youth holding a votive picture on a staff – showing a figure reclining on a bed with something in the sky above him (a divine apparition?) – resembles the young man at the head of Christ in the same picture (Fig.P.19c). Compositionally, and in detail, the Bayonne drawing is intimately related to Rosso’s style, and particularly to his works done between 1527 and 1530, during which he designed the frescoes for S. Maria delle Lagrime. The quality of the drawing further supports its attribution to Rosso, as it exhibits the same particular sensitivity to the description of form, details, and light that is seen in his paintings. 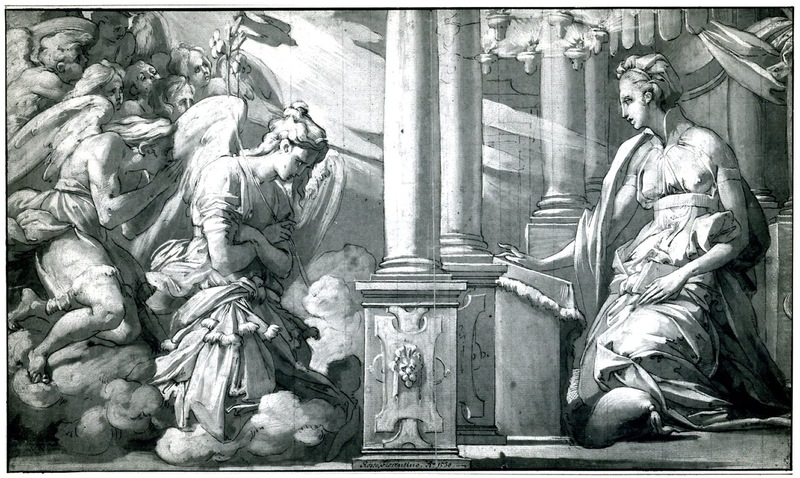 Although the slightly later Annunciation in the Albertina (Fig.D.43a) is more finished, it shows the same steely pen lines and careful brushwork with which the Throne of Solomon is drawn. 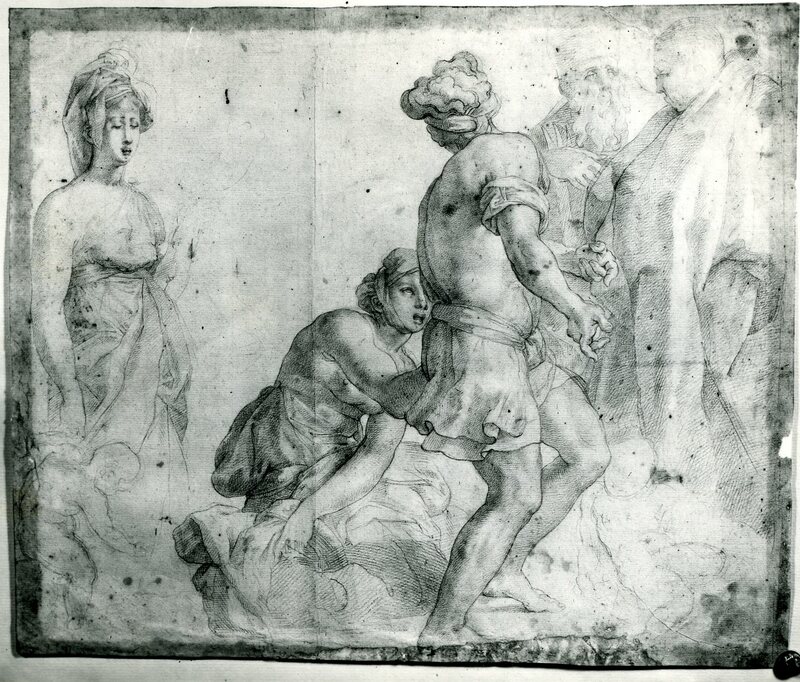 The Bayonne drawing is certainly an autograph drawing by Rosso, the distinctive original character of which is made clear by comparing it with the excellent but less poignantly detailed version, and possible copy, in the British Museum of Rosso’s drawing for the Ark of the Covenant allegory also made for S. Maria delle Lagrime (Fig.D.33Aa). Rosso’s drawing would have been made between 24 November 1528, when the Lagrime project was commissioned, and mid-September 1529, when Rosso fled from Arezzo. But as Rosso’s two versions of the Allegory of the Immaculate Conception (Fig.D.31; Fig.D.32), because of their close similarity to Rosso’s study of 1528 (Fig.D.29) for the Christ in Glory, would seem to have been done first for the Lagrime project, in 1528-1529, the Throne of Solomon was most probably made in 1529. On stylistic grounds it would seem to have been composed about the same time as the Ark of the Covenant allegory. COPIES: Paris, Louvre, Inv. 1576 (Fig.D.34 Copy, Paris, 1576). Pen and ink and wash over outlines in red chalk; 27.3 x 27.6, cut at the top and left side, and the upper corners also cut and added; laid down; wm?. LITERATURE: Kusenberg, 1931, 149, no. 14. Bean, 1960, under no. 146. Carroll, 1964 (1976), II, Bk. II, 301, under D.30. Paris, Louvre, Inv. 34951 (Fig.D.34 Copy, Paris, 34951). Pen and ink on transparent yellow paper; 30.6 x 25.9; laid down; wm?. LITERATURE: Hercenberg, 1975, 174, no. 403 (with the measurement reversed), Pl. CLII, Fig. 250, as from the shop of Nicolas Vleughels. Darragon, 1983, 53-54, n. 8. Comte d’Orsay, 1983, 180, Ors. 793. 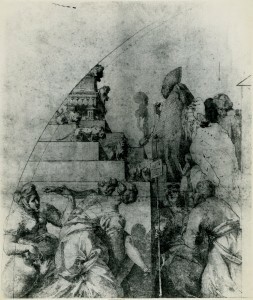 This copy, where the very top of the arched area is cut off, may have been traced from Rosso’s drawing. 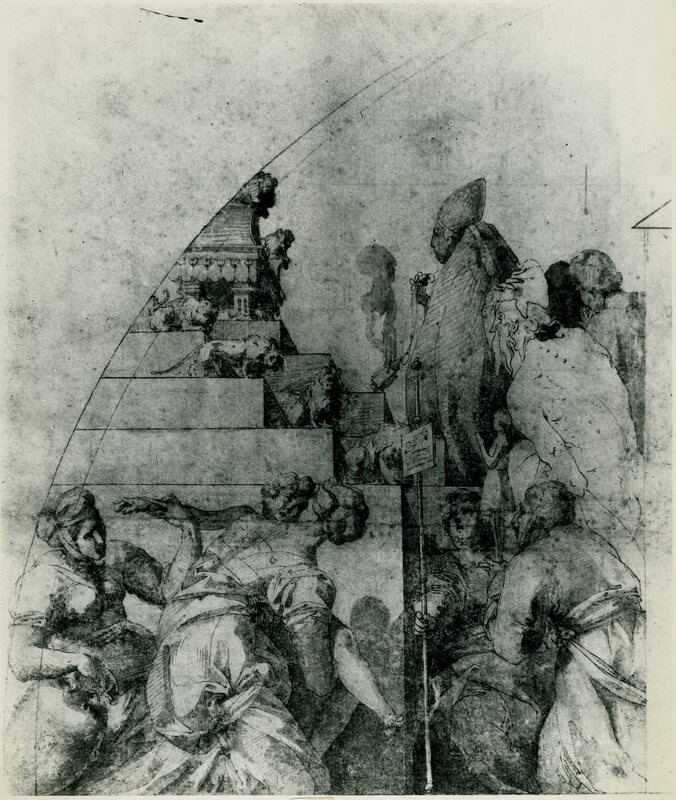 Hercenberg mentioned that the drawing also has brown wash, which must refer to the stain in the center of the drawing. 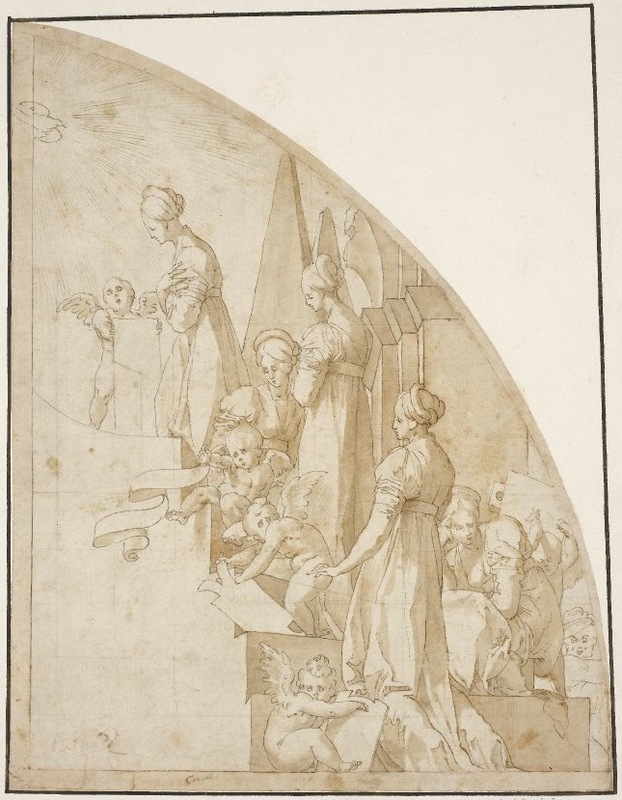 1 The double drawing of the arc of the drawing might imply that the area set off for a composition was intended for a scene for the narrower area to the left of the window in the façade. However, the light in the Throne of Solomon falls opposite to the direction of the natural light imagined as coming from the façade window.